Everyone seems to be “stressed” and overwhelmed in modern times. And clearly I am no exception: my un-optimized levels of “the 3 C’s”- Cortisol, C-reactive protein, and Creatine Kinase- indicate that I don’t get enough relaxation and recovery. After looking at my InsideTracker recommendation engine, I saw a familiar friend to calm down my inflammation: yoga. 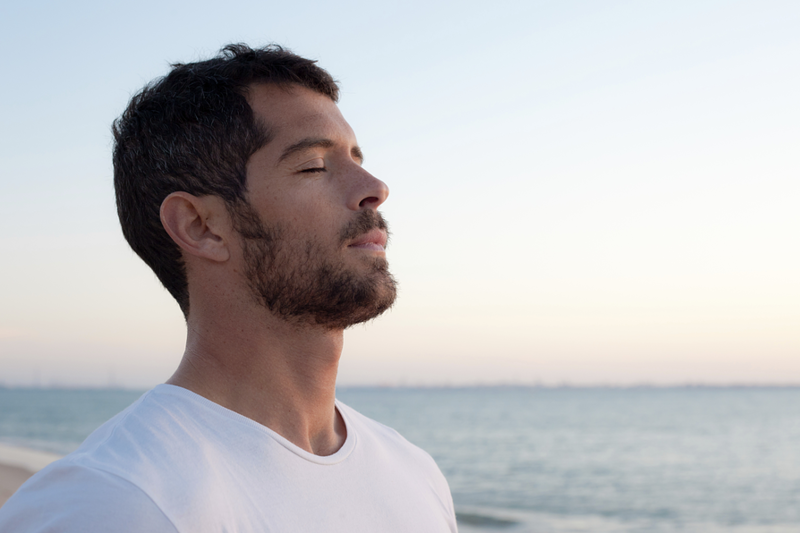 In this series, I look at some of the key personal and scientific benefits of this ancient practice from my Indian heritage and how I am using it to combat my personal modern-day battles with stress and recovery. Yoga is often thought of as some “stretching” fitness craze that has recently exploded in popularity with suburban housewives and trendy Millennials. But what really is “yoga”? Yoga is a set of non-religious mental, physical, and spiritual practices with the goal of harmonizing the mind, body, and spirit. Its origins date from India around the 5th and 6th centuries BC . The brand of yoga based on physical movement between postures called asanas is referred to as “hatha yoga” and originated in the 11th century AD . When we think of “yoga” in this article, we are referring to “hatha yoga” as opposed to the many other diverse branches that encompass yoga practice. Yoga recently peered its head into the US in the 1950s but didn’t become popular until the 1980s when people begun to seek out new, alternative interventions to supplement conventional biomedicine. Yoga practice is now practiced by an estimated 20 million US adults- over six per cent of the US population . Over 80% of yoga practitioners in the US are female . While Yoga is a very diverse practice with spiritual roots, it is classified by western biomedicine as a “mind-body exercise” along with other ancient practices originating from the Asian continent such as meditation and tai-chi . This means that each of these practices emphasize physical and mental recovery and relaxation in addition to physical exercise as opposed to competition and physical exertion seen in many western sports. Unlike other alternative medicine practices, such as the detoxification diet or homeopathy, there is a reasonable amount of clinical research and data indicating that yoga positively affects key biomarkers and overall health. Below we document some of fine-detailed research studies showing the potential benefits and limitations of regular yoga practice on cortisol, c-reactive protein (CRP), and creatine kinase- biomarkers which affect recovery, inflammation, and overall wellness. However, let’s first delve into the personal reasons why I am choosing to use this specific alternative medicine therapy. So, why am I choosing to do yoga as a tool to help my overall health? First off, both of my parents are from the Indian subcontinent where yoga originated. I often watched mom and dad practice yoga regularly while I grew up and talk about its wide arrange of health benefits. In fact, my dad still wakes up early in the morning and practices yoga. Because of their inspiration, I used to do yoga fairly regularly when I was a teenager. While I wasn’t a great competitive athlete, I was always fit and healthy because of a regimen that included yoga, weight lifting, and cardiovascular exercise. Unfortunately, ever since college, I have neglected to include yoga in my weekly routine. Part of the reason is that I have always lived in fast-paced cities- namely New York and Boston- where there is an emphasis to do things intensely and for a quick outcome. Thus, I only focused my exercise routine on weightlifting and cardio as they have “direct” impacts on health indicators such as red blood cell count, cholesterol, and body composition. And the other excuse of course: is that I am just too busy to relax. But I am not sure how sustainable “being too busy to relax” is anymore. When I got my second InsideTracker test, I was surprised to see that my levels of cortisol- known as the “stress hormone”- increased to stratospheric heights...after already being in the “high” zone with 27% of other users. 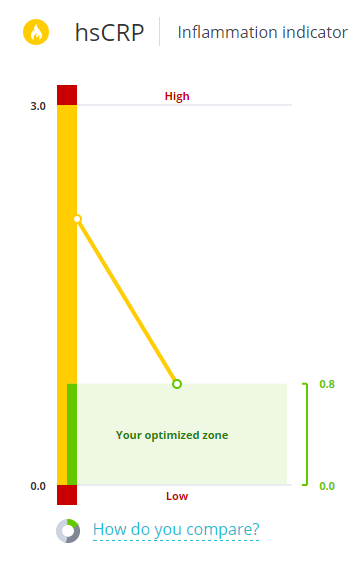 I was surprised because most of my other biomarkers stayed in the optimal zone or at least inched closer towards it. Similarly, while my creatine kinase and c-reactive protein trended from the “high” to clinically acceptable ranges, they were still not in the optimal zones where they should be. After the initial shock and some careful reflection, I realized that I was not taking enough time to de-stress between two jobs and preparing for upcoming medical school applications. I often feel tense and worried about the future- somewhat understandable for someone who just turned 24 years old. However, I needed to be more honest with myself and commit to more stress-relieving activities that, ahem, do not include going out to bars and clubs every single weekend after working. And I need to add some recovery to my workout routine which consists of weightlifting and jump roping while I blast every Taylor Swift song known to humanity in the background. On a more serious note, despite coming off as carefree, I have a lot of perfectionist tendencies such as trying to be good at everything I do, becoming close friends with as many people as possible, and not asking for help when I need it. While I still overall feel healthy and lead a good life with things that I enjoy, I feel that I could use some techniques to physically and mentally restore myself that are more cost-effective and self-driven than going to a spa or masseuse each day. And that is why I am tapping into my familiar ancestral roots of yoga. Below I document the modern-day clinical research supporting yoga as a useful method to manage stress and recovery-based biomarkers. As I mentioned earlier, of the three recovery biomarkers monitored by InsideTracker, my high levels of cortisol are rekindling my flame with yoga. However, what is this double-edged hormone in our bodies and if it can be harmful, why does the human body produce it in the first place? Cortisol is a key steroid hormone produced by the adrenal cortex located on top of the kidneys. It facilitates anabolic processes which means that it breaks down tissues to perform live-maintaining functions throughout the body. Healthy levels of cortisol are important for many key functions, such as suppressing an overactive immune system, metabolizing fat, and increasing blood sugar to provide you with energy to run away from the angry boyfriend of the girl (or guy) you hit on aggressively at that bar. However, cortisol production elevates to unhealthy levels when the brain and body experience prolonged “chronic stress”- a condition defined as an uncomfortable “emotional experience accompanied by predictably [unfavorable] biochemical, physiological and behavioral changes” . Because of elevated levels of cortisol, key reparative processes of the body are suppressed such as the immune response, the digestion and absorption of nutrients, and muscle growth. Furthermore, prolonged stress as indicated by unhealthy levels of cortisol can lead to the onset of mental illnesses such as depression and cardiovascular illnesses [4, 5]. Thankfully, the research examining yoga as a method to decrease levels of cortisol is pretty compelling. In a 2011 study, researchers recruited 54 clinically depressed patients with high levels of cortisol and divided them into three groups that each received a different intervention for three months: yoga practice only, yoga practice with antidepressant medication, and antidepressant medication only. The subjects were asked to take medication and practice yoga for 60 minutes at least once every two days (depending on which group they were in). The authors noted that “In all patients who received yoga with or without medications, the change in serum cortisol level was significant; [however] it was not so in those who received only medications” . Yoga was also associated with a stronger reduction in antidepressant effects as well compared to those who just took medication. These findings suggest that yoga may be a great complement to anti-depressants in reducing cortisol levels for individual with elevated, prolonged levels of cortisol. In another 2011 study, researchers recruited 22 female subjects with fibromyalgia to participate in a 75 minute yoga class twice weekly for 8 weeks. The researchers provided the subjects with questionnaires concerning pain surveying for intensity, unpleasantness, and acceptance. The researchers also assessed feelings of mental health including anxiety, depression, and mindfulness. Finally, salivary cortisol samples were collected pre-intervention, mid-intervention, and post-intervention. When comparing pre- and post-intervention, these women experienced quantifiable benefits across the board in each of the mental health and pain metrics . Most staggering: Levels of cortisol in these subjects decreased by 39% from pre- to post-intervention . Collectively, these findings suggest complete mind and body yoga sessions help reduce depressive symptoms and lower cortisol levels. C-Reactive protein- shortened as CRP- is a biomarker included in InsideTracker’s InnerAge and Ultimate Panel. It is produced by the liver, cells of the immune system, and fat cells called adipocytes in response to inflammation resulting from tissue rupture. Over two dozen research studies have shown an association between high baseline levels of CRP and the development of cardiovascular illnesses such as coronary heart disease , diabetes, stroke, and heart attack . Additionally, high levels of CRP are associated with the onset of mental illnesses such as depression and post-traumatic stress disorder (PTSD) . 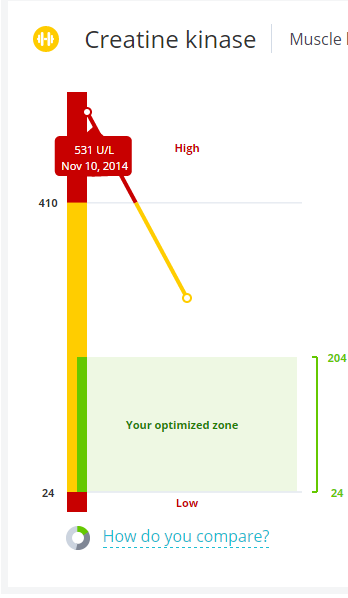 On my second InsideTracker test, my levels of CRP showed a noticeable decline. 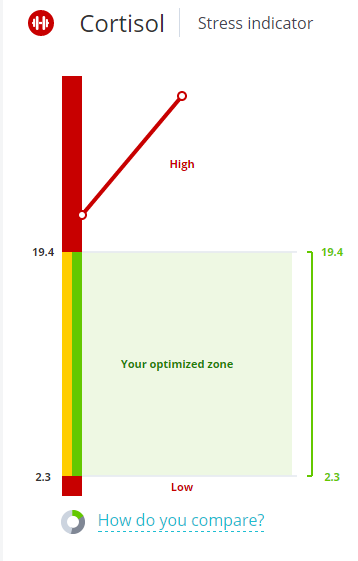 However, they were still above the optimal zone and while I just turned 24, I want to make sure that my mental and physical wellness is in a good place. Remember: prevention is about keeping yourself in the optimal zone! So, what does the research say on regularly practicing yoga and CRP levels? To some degree, it’s promising. In a 2010 study, scientists recruited 50 healthy women ages 30-65 with a mean of 41.32 years for a two week intervention study. Of these 50 women, 25 were novices who had only practiced 6-12 sessions and 25 were experts who had practice yoga regularly 1-2 times per week (75-90 minutes sessions) for at least 2 years, and at least 2 times per week for the past year. During the study, researchers had these subjects engage in various yoga postures and meditation routines during three separate visits per week. The researchers monitored the subjects’ blood CRP levels before, during, and after the yoga sessions as well as during two control conditions in which the subjects were not participating in yoga. The results of the study were interesting. On one hand, researchers observed no overall differences in inflammatory or endocrine responses resulting directly from the yoga session in either the novice or expert group. However, they also noted that detectable C-reactive protein (CRP) was 4.75 times higher for the novice group than that of the expert group . This was true even though the two groups had no noticeable differences in age, abdominal fat, cholesterol levels, and cardiovascular fitness- factors that often directly impact CRP levels. The researchers were not sure of the exact reasoning behind this association. While more conclusive intervention research needs to be done to assess the direct impact of yoga on levels of CRP, these findings suggest that regularly practicing yoga had a strong association with lower levels of inflammation as indicated by lower levels of CRP controlled for key demographic factors. Creatine Kinase- often abbreviated as CK- is an inflammation marker released in response. It is an enzyme found in the brain, heart, and skeletal muscle. When there is muscle damage, increased amounts of CK are released into the blood. Nearly all of the CK from the blood comes from damaged skeletal muscle- explaining my unusually high levels after my first test where I deadlifted the day before! Creatine kinase is strongly associated with elevated blood pressure and is a key marker of inflammation along with the other two C’s [12, 13]. While there are no studies assessing the impact of yoga practice on creatine kinase, there are studies showing a strong association between yoga practice and decreased blood pressure which may reduce levels of CK. In a 2014 intervention study in India, researchers recruited pre-hypertensive individuals- meaning that they had a systolic blood pressure of 120 mm Hg- 139 mm Hg- and divided them into two groups. The first group had 92 had a dietary & exercise modification without yoga while the second group of 92 had a dietary & exercise modification along with yoga practice. Both groups experienced a reduction in blood pressure. However, the diet & exercise with yoga combination produced a 33 per cent higher reduction in blood pressure compared to the other group (6 mm Hg vs. 4 mm Hg) . These findings suggest that yoga is a critical component in lowering blood pressure and thus creatine kinase levels. Biomarkers are a key component of what we measure at InsideTracker. After all, looking at quantifiable, algorithm-packed data and using actionable recommendation can be a pretty powerful method to optimize your health and wellness (See Laura Ingalls’s tale to see her improvements across the board!). However, we know that health is much more than what you can measure: it’s a holistic concept defined by a qualitative sense of well-being. Thus the reason why the World Health Organization defines it as “…a state of complete physical, mental and social well-being and not merely the absence of disease or infirmity” . Many disease-free people who regularly practice yoga describe feeling more “relaxed”, “restored”, and simply “better”. And research supports these subjective experiences with quantitative evidence. A Germany study conducted last year surveyed 233 non-clinical practitioners of yoga- 210 of which were women- about their psychological well-being. They also surveyed 83 women who practiced gymnastics but not yoga as a control group for the yoga sample. After controlling for socio-economic factors, the researchers noted a modest correlation with yoga practice and metrics such as mindfulness, inner correspondence, and religious/spiritual well-being . Additionally, yoga practitioners who practiced for at least twice a week showed a significantly higher amount of psychological well-being compared to those who practiced yoga less frequently or not at all . Finally, these same practitioners exhibited fewer depressive systems . These findings suggest that regular yoga practice can help improve subjective feelings of well-being and happiness. Finally, think you need to engage in hour long sessions each day to experience yoga’s benefits? Think again. A 2012 research study recruited 30 female college-aged participants and had half of them participate in 20 minutes of moderate cardiovascular exercise and the others in 20 minutes of yoga. They then had these participants perform cognitive tests and observed significantly shorter reaction times and increased accuracy in the yoga group than in the other group. This suggests that yoga can have a mind-enhancing effect on you in as little as 20 minutes and may help to reduce cortisol as well . Yoga has proven anecdotal evidence to show that it can help you with key recovery biomarkers monitored by InsideTracker. It can also make you sharper, more concentrated, and more give you that warm, fuzzy feeling Inside. While most of these studies had subjects use yoga for multiple hours per week, most practitioners agree: fit in whatever yoga you can throughout the week. Research shows that even 20 minutes once a week might even have mind-altering benefits… literally! I am now working on incorporating back into my lifestyle routine and practice it in at least twice a week for 30 minutes. Would you like to know where you stand with your biomarkers and if yoga can help you get on that path to quantitative and qualitative wellness? Click below to check out our Ultimate Plan and monitor your progress with yoga. Samuel, Geoffrey. The Origins of Yoga and Tantra: Indic Religions to the Thirteenth Century. Cambridge, UK: Cambridge UP, 2008. Print. Editor, YJ. "New Study Finds More Than 20 Million Yogis in U.S. - Yoga Journal." Yoga Journal. 5 Dec. 2012. Web. 10 Apr. 2015. <http://www.yogajournal.com/uncategorized/new-study-finds-20-million-yogis-u-s/>. Baum, A. (1990). "Stress, Intrusive Imagery, and Chronic Distress," Health Psychology, Vol. 6, pp. 653-675. Hugo, Fernando N., et al. "Chronic stress, depression, and cortisol levels as risk indicators of elevated plaque and gingivitis levels in individuals aged 50 years and older." Journal of periodontology 77.6 (2006): 1008-1014. Smith, George Davey, et al. "Cortisol, testosterone, and coronary heart disease prospective evidence from the Caerphilly Study." Circulation 112.3 (2005): 332-340. Thirthalli, J., et al. "Cortisol and antidepressant effects of yoga." Indian journal of psychiatry 55.Suppl 3 (2013): S405. Curtis, Kathryn, Anna Osadchuk, and Joel Katz. "An eight-week yoga intervention is associated with improvements in pain, psychological functioning and mindfulness, and changes in cortisol levels in women with fibromyalgia. "Journal of pain research 4 (2011): 189. Danesh, John, et al. "C-reactive protein and other circulating markers of inflammation in the prediction of coronary heart disease." New England Journal of Medicine 350.14 (2004): 1387-1397. Ridker, Paul M. "Clinical application of C-reactive protein for cardiovascular disease detection and prevention." Circulation 107.3 (2003): 363-369. Wium-Andersen, Marie Kim, et al. "Elevated C-reactive protein levels, psychological distress, and depression in 73 131 individuals." JAMA psychiatry70.2 (2013): 176-184. Kiecolt-Glaser, Janice K., et al. "Stress, inflammation, and yoga practice." Psychosomatic medicine 72.2 (2010): 113. Brewster, Lizzy M., et al. "Creatine kinase activity is associated with blood pressure." Circulation 114.19 (2006): 2034-2039. Johnsen, Stein H., et al. "Creatine kinase activity and blood pressure in a normal population: the Tromsø study." Journal of hypertension 29.1 (2011): 36-42. Thiyagarajan, Ramkumar, et al. "Additional benefit of yoga to standard lifestyle modification on blood pressure in prehypertensive subjects: a randomized controlled study." Hypertension Research (2014). Gaiswinkler, L., et al. "[The relationship between Yoga Immersion, psychological well-being and psychiatric symptoms.]." Neuropsychiatrie: Klinik, Diagnostik, Therapie und Rehabilitation: Organ der Gesellschaft Osterreichischer Nervenarzte und Psychiater (2015). Gothe, Neha, et al. "The acute effects of yoga on executive function." (2013).